Dollar store craft alert! 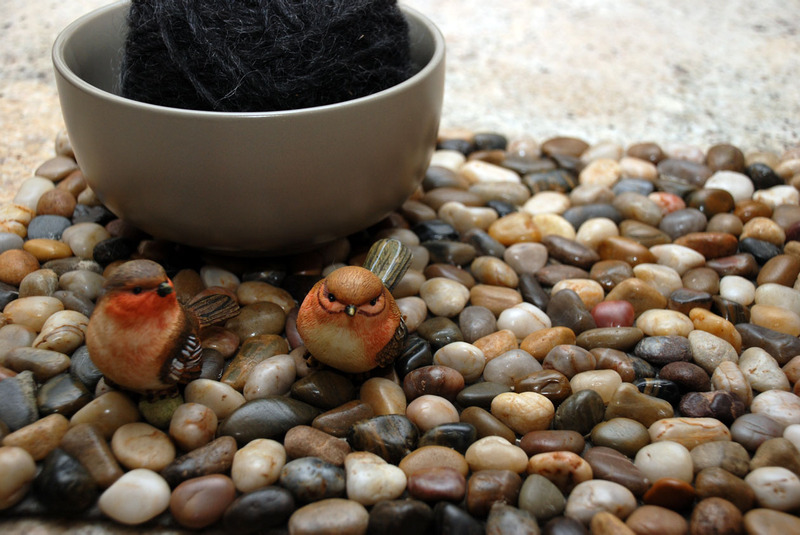 Look at this pebble mat I made from Dollar store pebbles and heavy wool felt I had on hand. I saw these in a local floral shop and knew I had to make one. Here is how I did it! Time was the only real "investment" in this project, and it was so easy! Spill out your pebbles and randomly "glue" with a small amount of adhesive. Go easy, you do not want this to show later. Start at one corner and work outward for the best result. Fit your pebbles together as close as possible. This is why I chose a stony color for my base fabric. Let dry/cure for at least twenty-four hours. This mat would be lovely on a table as a centerpiece with a plant on it or if you were very ambitious you could make a set as placemats! Super cute and fabulously creative! I might just have to try this one. This is so cute... Did it take a while to dry? I have a spot in my bathroom that I wanted to do this as flooring except we almost got high when we poured in the glue and it was taking forever to dry, very, very smelly. Wow, so cute and creative! Great job! Kathy, it was set pretty quickly, I used "liquid nails". It was totally cured in twenty-four hours. I guess for a floor I would use a grout like adhesive instead of glue and then grout when finished. Thank you for visiting! I totally love the look of this finished project! What if you made a long skinny table runner? Or a round one? You've got my brain a workin' now. I have a place in my bathroom that needs this mat. Very clever! I made the hop over here from Today's Creative Blog, and I love what you did! That's very cleaver and sooooo thrifty! Love this and I have those dollar store stones! Fantastic idea!!! You did a great job! I have seen this in my favorite catalog for more money than I care to spend and I have always thought of trying to make my own. Thanks for these great instructinos. I am definitely going to try this. Maybe a table runner. This is too cute! I've never seen anything like it before. Thanks for stopping by my blog. And yes, I'm self taught. I did buy a Simplicity pattern once about a million years ago, but couldn't figure it out. Then a book..yuk..talk about taking the long way to do something. I finally kept buying cheap thrift chairs and through trial and error I "got it". The journey was pretty fun though. Each piece is a challenge. I love making the slipcovers. Let me know if you try it. I could try this with pebbles from the beach!!! Lovely idea! I could see a runner down a table. Then I would put candles and ferns in pretty pots on it. I have never seen pebbles at the Dollar Store. I have also been inspired by things in the Dollar Store. Sometimes they have wonderful little plain wooden boxes you can do things with. Hi @Evi, did you find the pebbles at Dollar Tree? They're on the candle isle. I wonder if this would be best made on a piece of cardboard or recycled plastic of some type to keep it flat when picked up? I love the look! Yes, you could use something firmer, even a piece of luan board. The rocks did stay cemented firmly on the felt when I moved it to another room. I was even thinking that a center of grass or moss would be pretty on a table as well. That would definitely require a stiffer surface. I would love to see what you come up with, please share! Thanks for your comment...I love hearing from fellow artists. Do you have children that love rocks as much as mine? LOL My daughter will LOOOOVE this! Thank you! I love love this ! I must try it. Could you actually use it as a mat or is it just for decoration ? I came across your blog looking for tutorials on how to make felted pebbles for a pillow, but this seems a lot quicker and easier and cheap to make! Thanks for sharing. I think I would try it on a regular mat or rug, I love the take runner idea . Roufie, yes I believe you could use this as a mat. It has now been in the back porch during this cold winter and it still is intact and secure. I would love to see your mat if you make one! Thanks for stopping and the nice comment. I couldn't wait to try this project. I got started on it later on that afternoon. I used a 20x30 rectangle doormat from Mainstays, got it at walmart. It is thin but looks pretty sturdy to handle the weight of the rocks. I had to go back to the dollar store and get more rocks. I ended up using 11 bags in total. My husband helped me glue the rocks on the mat, which was very helpful since I was using a larger mat. I haven't tried to move it yet since it's still drying. I will definitely make another one, I really like how this one turned out. Thank you for sharing. I don't think I am able to post a picture here so here the link to see the picture. Oh my, Roufie. Your mat turned out great. Eleven bags, WOW! We are kindred spirits, when I like a project idea, I have to try it immediately. Thanks for sharing your picture. CUTE!!! Guess what I'm doing this weekend!! I love those pepples from Dollar Tree. I did my whole bathroom floor (took a month)and sealed it for the most AMAZING spa-style floor. So cute. --11 bags! that must be heavy? Have a fabulously creative weekend! We made ours personal by taking dark rocks and adding a big C in the middle and adding the lighter ones around it!!! very cute! hoosiergirl: I don't know what you could do to make it flat...I have have displayed things on it and it wasn't too uneven; as far as weatherproofing, the only thing I can think of would be to grout between the pebbles. I have not tried that, however. Michelle: How clever, to add a monogram!!! Love to see a picture of it. What about making smaller ones (maybe 6" circles) as hot plates..... So cute!! I love it ! Found you thrpough the Tip Junkie's site. Too cute, great idea. I've been searching for a craft for my Girl Scouts and now I've found it! We will make trivets! i love this and i'm going to make a little welcome mat to stop people tracking in rain and mud from the balcony. that non-slip bubbly foam rubber stuff would work well as a backing to keep it from sliding across my hardwood. i've never been able to find e6000 or these other specialty glues people talk about. does michael's carry them? is there a different kind of glue that would work, like epoxy maybe? This is such a cute idea!!! I like new ideas. I would love to try this! This totally solves my problem of not being able to find the perfect drink coasters to match my rustic-ish cabin-esque them in the living room...I'm so inspired! Thanks for the great idea! I'm going to try this for my front door. Thanks. This is great! I have been looking for something like this. Thank you. I love rocks... I have several bags fro DT just waiting for a project. Actually, the original idea was to glue them to the front of the bathtub, because it's a 'melted ice cream' color (think neopolitan all mixed up - kind of a brownish pink). I could start with the apron, work on the top, then eventually do the inside. But I would NEVER EVER be able to remove the tub again! (Just had to do that recently. See 'old trailer bathroom renovation' on my blog) Oh, but it would be beautiful... I love rocks. Did I say that already? However, for such a huge project, if you didn't mind that the rocks weren't polished, I would suggest buying a bag of pea gravel from your local hardware bigbox store or nursery. Such a great idea. Lovely colors. I was wondering how heavy one would be that was 18x44 as I would like to do one for the bottom of my tub. Mainly for display as we don't use the tub very often at all, we have a stand alone shower beside it that we use. I am wanting to do something that makes the tub look really cool. I guess I would have to remove the mat if having a bath, wonder how heavy it would be. Hmmm, getting inspired.